What kind of niche blogger would I be? 1) A Sewing Blogger. With a focus on dressmaking and themed/quirky outfits that aren't quite costumes, so that they can be worn in real life. I'd love to learn advanced seamstress skills and design clothing for myself. There's a secret side of me that wants a sewing room filled with all my equipment and tons of material and the skills to be able to make the things I imagine. 2) Theme Park Blogger. I would make a list of all the theme parks I wanted to conquer, and then conquer them. I tend to research vacations pretty heavily before going, so I'd put together resources with park information and strategies to get the most park out of each day, as well as rate parks on a value-for-money scale and choose my favorite rides in every park. This blog would be a combination of Pinteresty resource posts with practical information on parks along with not-so-pinteresty colorful tales of adventures and misadventures while on trips. I would travel the world going to theme parks, and people would mock my obviously skewed priorities. 3) A Dollhouse Blogger. I would spend limitless amounts of money (after all, this is my imagination) creating elaborate dollhouses to fit every sort of theme and time period in existence. I'd have the cutest mini-rooms out there and people would read my blog purely for the entertainment value of seeing a grown woman so unabashedly committed to dollhouses. I'd probably delve a little into small-scale model building as well, another pricey but fascinating hobby. 4) A Prank Blogger. This would be a joint blog with Angel, of course, as he'd be the source of most of the pranks. I tend to be pretty picky about pranks and could probably chat endlessly about the importance of elegant, clever pranking as opposed to the sort of pranking that is vulgar, common, and mean. I love the kinds of pranks that end up putting a smile on someone's face. (Speaking of smiling faces, 9 months after he left the hospital, Angel's former coworkers are still finding the pictures of his face that he taped to obscure locations all over the unit). I think this would be a really fun blog to create and find content for, but it probably wouldn't appear, at first glance, to be a highly professional endeavor. It's probably equally obvious that these niche blogs of mine would be awesome, and that they are completely impractical. Sewing rooms? Dollhouses? Endless pranking? Inconceivable! What realistic or unrealistic niche blog do you secretly think would be fun to write? A dollhouse blogger, I love it! I would love to the a perfume blogger, I love perfume and I guess it would be really cool to figure out how to describe 'scents' because well you cant do that online, yet! Awesome ideas, loved the 4th one! A pug blogger! LOL It would mostly need to be photos though, since she hasn't figured out to use the keyboard with her paws yet. Awww :) I love the doll house idea! Too cute! I'd probably be an all-things-dogs blogger, or a fitness guru blogger (since we are officially imagining things now, haha). Ooh! If you and Angel started a prank blog, it would be a lot of fun! If I started a niche blog it could be about chess or politics. Haha a prank blogger sounds awesome! And a theme park blogger sounds like so much fun! I think I'd say a Prank blogger. I'd get a kick out of making people laugh and being silly! I would say diy would be my niche. But I can't pick just one. I'm all over the place as well. I like it that way! Haha this is great! I think the whole "niche" thing can be a bit of a challenge sometimes... I would love to write a blog about cafes around the world, but I think serious hipsters have definitely beat me to that! 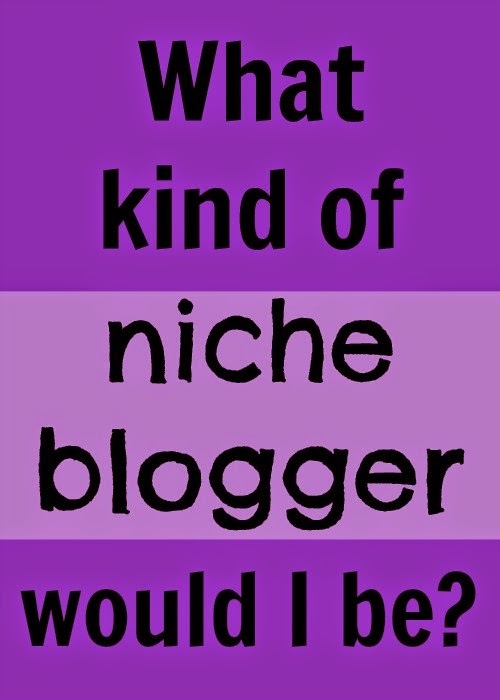 I struggled for a long time because I wanted to figure out what niche I fit in. I would get a great idea for a post and then realize that it had nothing to do with the direction I wanted my blog to go in and I would get so down about it. Then I finally realized that I started my blog as a creative outlet for myself and I should write whatever makes me passionate. So that's what I'm starting to do! I'm a travel, lifestyle and marriage blog I suppose. I don't really know to be honest. Maybe you could tell me. I wish I could come up with a good niche blog -- being a "mommy blogger" is tough! There's so much competition. A prank blogger! Lol. Fun post. I'm in the same boat, feel pressure to narrow it down to a niche but I just can't! Oh man, I love the last two! A prank blog would be just awesome. As for me, I would love to write a party blog...you know, party planning, tips and inspiration! But I can't see myself ever being focused enough to write about one topic...so random blogs for the win! ohhh my goodness please do the dollhouse one because i am obsessed with miniature things and i know you would do a top-notch job. maybe this could even involve pranking other doll houses?! I would totally read your doll house blog!!! I love already have a niche blog but I would love to have a real one about my struggle with weight and how I would successfully lose it and motivate a ton of people to live healthy. Nothing exciting but I think fitness/health is so important even if I don't practice it. (I know I am a total hypocrite). I think you might be onto something with the dollhouse blogging! That could be so interesting! Very interesting list of niches! I love the dollhouse and especially the pranks. I would absolutely read your prank blog! Genius! That picture prank is hilarious. I would definitely read that dollhouse blog! I was OBSESSED as a kid with miniatures and secretly still love them to this day :) Fun post! When we were starting to plan our wedding, we contacted this planning team and received an email back almost right away. The party planner was very helpful with any questions that we had regarding their services and answered emails and phone calls very promptly.